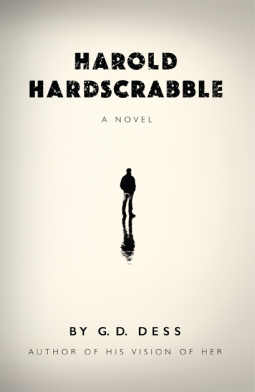 Harold Hardscrabble is a sympathetic novel filled with philosophical musings on the state of society and our place within it. It captures the feelings of frustration and helplessness that many of us experience in our daily lives. These sentiments are embodied in the story’s contemplative, quietly charming protagonist, Harold, who, like Walter Mitty, lives largely in his own world of thoughts and dreams. We follow Harold’s transformation from a dreamer to a man of action as he struggles to discover how to live a meaningful life in a materialistic world. A contemporary novel that recounts the journey of its ordinary, quietly charming protagonist Harold, whose search for self-realization goes extraordinarily wrong. It is today’s American tragedy. G.D. Dess is the author of the novel His Vision of Her (Harper & Row). His critical reviews and essays appear in the Los Angeles Review of Books and Goodreads. Mr. Dess was born in Michigan and has lived in six states and ten cities throughout the country. For several years, he lived in Paris, France, where he taught English and worked as a translator. Currently he lives on the east coast with his Wheaton Terrier, Beckett.